It's cheeky, it's Tiki, and if you don't heed the reminder in the restroom, the toilet may just get leaky. A sign in the pink flamingo bathroom at Little Nickel advises patrons to please refrain from flushing Chainsmokers CDs, Cleveland Browns jerseys and fidget spinners. And that's just one of the details that makes Little Nickel, which opened earlier this year, such a charming spot. Prolific restaurateurs Johnny and Katrina Giavos are the masterminds behind Little Nickel, and their son Constantine, who also conceptualized the decor at Perly's and the Continental, made the new restaurant's interior what it is. He's a master of the art of lovingly creating a space where the restaurant's personality shines through, and Little Nickel's design is unlike any other in town. 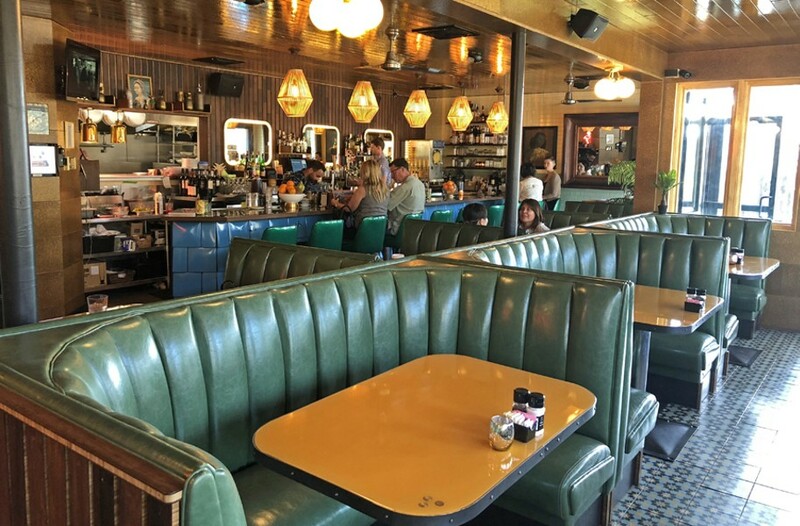 The turquoise booths are old-timey and cozy, the lighting above the bar features Tiki-style woodwork, and the yellow, gray and black floor tiling pops without being overwhelming. And the decorations are well matched with the menu, which blends a range of culinary influences like Philippine, Mediterranean and Hawaiian. Really, these two words tell you everything you need to know: Hawaiian nachos.